Salted Maple Honey Caramel Corn with Toasted Pecans. Homemade caramel corn is so surprisingly delicious. Sometimes that’s easy to forget when all you’ve tasted recently is store bought,yellow #5, high fructose corn syrup drenched caramel corn. But then you take a bite of this crisp,sweet,buttery,light homemade treat and you realize what you’ve been missing. My mom loves caramel corn. This is the second batch I’ve made in two days. (shhh,don’t tell!) I made it as a random surprise for her a few days ago and the whole bowl was gone after that evening’s dessert. Don’t worry,this time I doubled the recipe. I really can’t stand cooking with corn syrup. Even if I buy dark corn syrup from Whole Foods, I still feel strange about serving it and would much prefer to find a different recipe completely or a way to substitute it. I found out a while ago that you could make caramel with honey or maple syrup instead of corn syrup so, using naturallysweetrecipes.blogspot.com‘s Honey Caramels recipe loosely as a guide, I set to work. 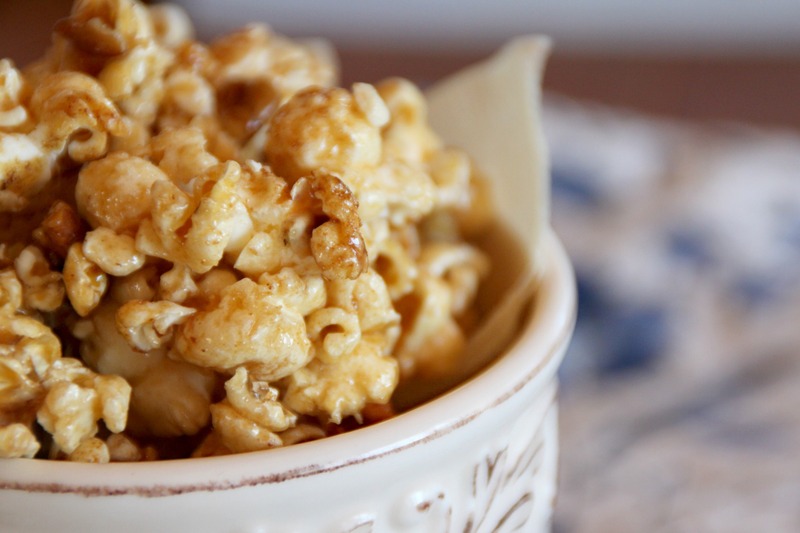 This tastes like the best gourmet caramel corn you’ve ever had…but better. 1.) Combine honey (if using),maple syrup, sugar, and milk in a large pot over medium high heat. Bring to a boil,stirring occasionally with a wooden spoon, until the mixture comes to the soft ball stage. You can test this by dropping a small amount of caramel into cold or ice water. If the mixture stays together instead of dissolving and forms a soft ball that you can lightly roll in-between your fingers, then you are at the soft ball stage. Soft ball stage normally happens around 234 F-240F (112.78 C) measured on a candy thermometer. 2.) Take mixture off of heat and mix in butter,vanilla extract,and salt. Set aside. 3.) Meanwhile,pop 7 tbsp popcorn kernels to get about seven cups of popcorn. Pour into large bowl. 4.) Pour warm caramel over the popcorn and stir to coat. The caramel doesn’t have to touch every piece. That will be fixed during the baking. Mix in chopped pecans. 5.) Butter a large rimmed baking pan and spread popcorn mixture evenly inside. Bake for 10 minutes,stirring every 2 minutes to make sure it is evenly cooked and your caramel corn doesn’t burn. 6. )Remove from oven and let cool slightly or until safe to touch. If you let it cool too long then your caramel corn will harden onto the baking pan and you won’t be able to pry it off without breaking it. If this happens then just pop it back into the oven at 350°F (121.11°C) for a minute or two and it should become soft again. This entry was posted in Uncategorized and tagged dessert, food, gourmet caramel corn, homemade caramel corn. Bookmark the permalink. 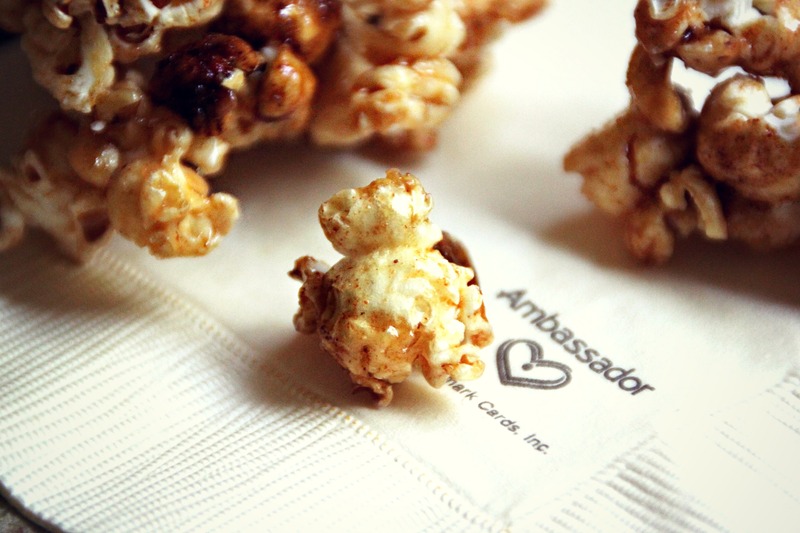 5 Responses to Salted Maple Honey Caramel Corn with Toasted Pecans. Oh my goodness. I was reading this at 5.30 this morning (small child) and it made me want to get up and cook. Thank you! 🙂 I hope you can find some time to, this is definitely my favorite ever caramel corn. This looks fabulous!! Thank you for linking back to us so I could find your blog! Your site is adorable. 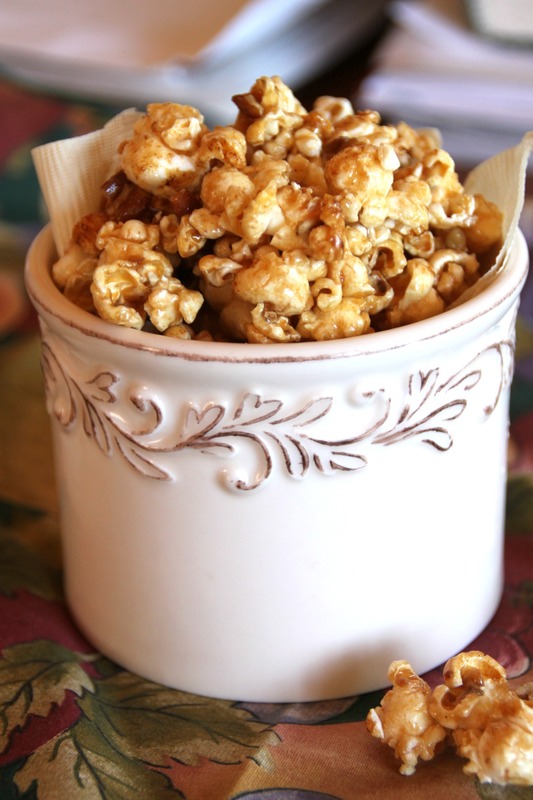 This popcorn looks so delicious and what a great use for caramel! I will for sure have to follow your lead and try this out!! Thanks! Thanks! This is just a baby site but I’ve been working hard on getting it out there. 🙂 Awesome,let me know how it goes? I’m sure it will turn out delicious. I am making this today for a birthday party of 40 people. I will let you know how it goes…..